Wood router is essential for all serious woodworker’s tool kit. Wood router is simple tool with electric motor and cutter held in a strong steady framework which rotates at higher speeds. When plunged into a block of wood, wood router makes a hole and when you slide it in a direction, it turns into a groove. A wood router is a versatile machine and perform various tasks like cut inlays, cut holes and rebates, shape wood, trim wood flat, recess hinges, cut screw threads, decorative flutings, copy carve, cut traditional joints, profile edges, make new jointed boxes, drill clean holes, make shallow reliefs and create adzed bowls. There are 3 types of wood routers, plunge base routers, fixed base routers or hybrid routers that can be swapped between the tow. With fixed base router, router is fixed and protrudes past the surface at fixed depth. Like drill, it guided by your hands. Many woodwork shops have fixed base routers as they are widely available, easier to learn, not top heavy and cheap as well. These routers are best for all purposes and good for edge shaping as they are easier to use. Plunge based routers are designed to set the cut depth and plunge bit in the material. They aren’t as maneuverable as the fixed based routers however give more precise vertical cuts. 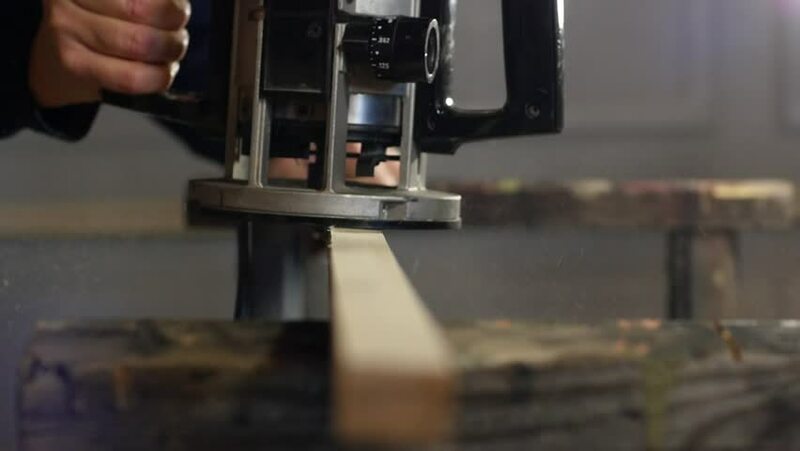 A plunged based wood router, allow you to make perfect vertical holes as well as grooves in wood as you plunge down at controlled vertical angle as the drill is mounting in housing. With fixed based wood router, there will be few errors as you are handling entire housing with hands and will not allow to get precise vertical angle. There is another type called hybrid wood router that run off same motor which allow to swap between both types of router just by changing the housing. Best wood router is one that meets your needs and wants. You never go wrong with hybrid wood router. As soon as you decide the type of wood router, you have to figure out the power you need. In the world of wood router, power is calculate in horsepower, with general router that deliver 1.5 – 3.5 horsepower and 3 – 15 amp range. You may also find trim wood routers that are sub 1 HP as well as designed to trim off excess of paneling or edge. They usually be operated with one hand. 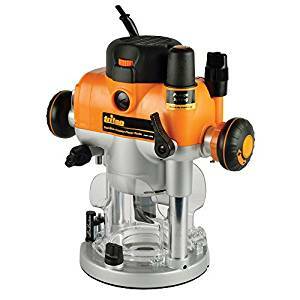 Any reasonably powered wood router in 1.5 – 2 HP range can be enough for most if not all woodwork jobs, from soft to hard woods and even some soft metals like gold. When working with metals and higher loads, consider a wood router with higher HP and the ones that have the option of adjustable RPM, especially when you don’t need an extra power for the lighter loads as well as those automatically maintain a constant RPM regardless of heavier loads. You must consider both type of router as well as power while buying one for you. 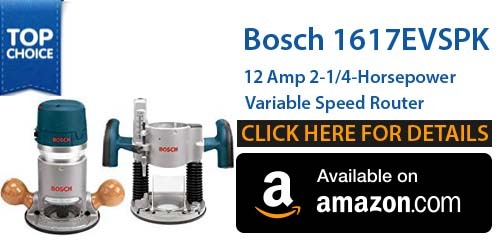 Bosch 1617EVSPK wood cutter is the best if you need an all-round router with adjustable RPM. Its 2.25 Horse power motor which has variable speeds ranging from 8,000 RPM for softer to 25,000 RPM for toughest metals. Just adjust knob on top for changing the speed. The Bosch 1617EVSPK also include a built in monitoring mechanism which ensure you to get a steady speed throughout the cut. When it detects material is limiting the bit’s speed, it adjust rotating speed up or down in order to maintain constant RPM. A nice soft start feature is also there to make it not jerk on initial contact with any type of material. Bosch just is a hybrid wood router which means you get 2 routers for price of just one. Although it has only one motor, just by switching the platform, you can change between a plunged and fixed based router easily with swift clamp mechanism. Ideally it’s good to get both types of routers to perform a wide variety of jobs. The precision of bit depth is really admirable as you can easily fine tune it over a range of 1 inch with an accuracy to 1/64 of inch. Both plunged and fixed based routers come with router bits that are centered with sub-base that makes it easy to keep bit along cutting line. Its soft grip handle is also perfect and fixed based wood router is fine for being mountable to the router tables with the threaded holes. Bosch 1617EVSPK is durable with aluminum base and housing as well as the power switch which is entirely dust sealed. 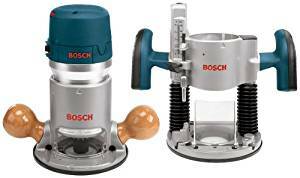 Overall, Bosch 1617EVSPK is the best wood router for those who need a versatile mid powered wood router which is durable and has variety of stability features. Dewalt DWP611PK is the most famous hybrid router and is the best wood router for those looking for light low end device which is both plunged and fixed based router. Although it just has 1.25 HP motor, it delivers the speeds from 16,000 – 27,000 RPM. Dewalt DWP611PK includes all of the essentials features of handy wood router: such as automatic control system that helps the motor to maintain constant speed always and a superb bit’s depth adjustments for an accuracy of 1/64 of an inch. Moreover, it has dual LED lights in order to lighten up sub-base and to ensure you to see each and everything while you work. The way the whole platform is setup, area of drilling is really pretty dark. With built in lights, you can get much better accuracy. This is usually an overlooked feature and is a bit unique feature to Dewalt. The switch between fixed based and plunge based is fairly seamless and simple without any tool required. We like plunge base router because it has five steps adjustable turret which let you cuts piecewise. All in all, Dewalt DWP611PK 1.25 HP Combo Router is the best wood router for those who need a low end combo router which will do any type of simple woodwork task. Festool 574342 OF 1400 is a heavy duty which get most if not all woodwork jobs complete. When it is about precision accuracy, there isn’t any competition for Festool wood router. It is a plunged based wood router, therefore if you are looking for fixed based look elsewhere. Festool shines in its precision and dust collection. About dust collection no other brand you see close to it. Dust is bad for health, it waste your time cleaning, and doesn’t look good to see them all over. Although an overlooked feature so far, dust control feature in this device makes it really unique. Moreover, what makes Festool Wood router apart form Bosch and Dewalt is its accuracy in all aspect of implementation and design. All guesswork is eliminated with its clear center mark on each face of base with metric depth scales. This saves you from fumbling with lot of fractional imperial units like other wood routers. Moreover depth control locks securely, that may not be case with other models. Locking and plunging is quite effortless, balanced, easy, and doesn’t have crazy vibrations. Its depth adjustment is extremely precise and therefore produces beautiful and accurate cuts. 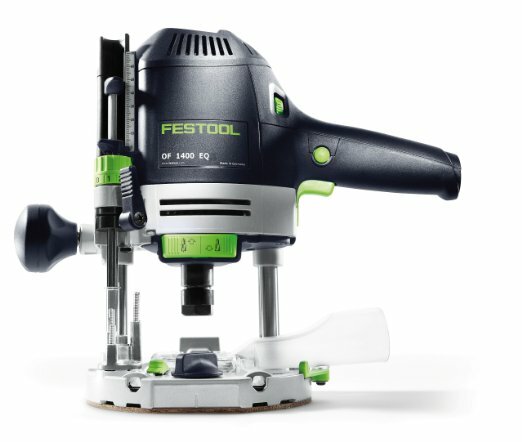 Festool 574342 OF 1400 EQ Router has a smooth operation and it is the best router for those looking a separate plunge based wood router. 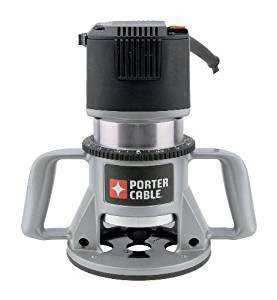 The Porter-Cable 7518 5 Speed router provides 5 speeds from 10,000 to 21,000 rpm, to help you easily tackle variety of jobs and improve productivity by saving your time and effort even with big bits or heavy cuts. Its 15 amp electron motor has speeds of 10,000, 13,000, 16,000, 19,000, and 21,000 rpm to give enough power to help handle all the toughest jobs. For smoother performance from get-go, soft-start feature of its motor reduces torque at start-up, and it maintains constant speed under load. This auto release collect system and soft start motor save your time and effort by allowing easy bit removal after job done. Sealed ball bearing design makes it stable and durable by keeping dust out from important parts and prolong its life. At the same time its precision machined aluminum motor housing as well as base stand till roughest and toughest jobsites. Moreover an integrated cast handle is there to provide extreme stability during operation, prevent wear and tear and improve the precision of this machine. The pack consist of a 5 speed router, fixed base, motor, ½ inch collet with wrench and an operating manual. It also comes with 5 year warranty. Triton TRA001 includes a powerful 3.25 HP motor that run at 8000 -21000 RPM’s to handle the toughest jobs. It has a wide array of finest features including direct reading, easy-set, 3-stage turret for accurate preset cut depth. Single button switches from plunge to fixed-base router with pinion and rack height adjustments. With automatic spindle lock that engages only at the time when switch is closed, bit change is easily achieved through base and single wrench. Variable speed and soft start lets you choose perfect speed for all types of cutter. Micro Winder allows steady fine depth adjustments through full plunge range. A safety switch shutter lock closed in bit change mode to avoid the power-on. A Multi-Function fence gives an excellent control for circle cutting and handheld use. Detachable plunge spring enables easy bit adjustments when table mounted. Completely enclosed guarding gives maximum safety from cut zones. Side air vents decreases dust entering in motor casing when it is mounted upside-down in router table. 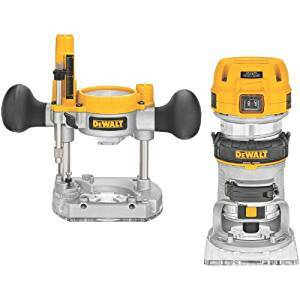 The package includes 3.25 HP Router, a 1/2-Inch collet with 1/4-Inch reducer and a wrench and multi-function fence.